Proverbs 4:20-23 says, "My son, give attention to my words; Incline your ear to my sayings. Keep your heart with all diligence, for out of it spring the issues of life." Years ago a woman, with her little baby, was riding in a stagecoach in western Montana. The weather was bitter cold, and, in spite of all the driver could do to protect her, he saw that the mother was becoming unconscious from the cold. He stopped the coach, took the baby, and wrapping it warmly, put it under the seat, then seized the mother by the arm, and dragging her out upon the ground, drove away, leaving her in the road. As she saw him drive away, she ran after him, crying piteously for her baby. When he felt sure that she was warm, he allowed her to overtake the coach and resume her place by her baby. Can we not imagine her gratitude when she realized that he had saved her life? He had done as God sometimes does, to shake us out of soul-lethargy and moral sleep which would end in death. Sometimes God is like that stagecoach driver. He will allow things to enter our lives that nearly devastate us. But, He does it to grow us and teach us more about Him. Now, we all know that trouble and trials are part and parcel of the human life. After all, Job said it, Job 14:1; Job 5:7. And so did Jesus, John 16:33. Burdens, troubles, trials and difficulties are going to come our way! That is a given. Felix Neff said, “A Christian without affliction is like a soldier only on parade.” However, what is not a given is what you and I will do about the trials and troubles that come our way. In this series called, Help! 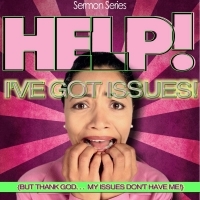 I've Got Issues!, we will explore how to let God handle the stuff we can't!